Many people are still passing through Hungary every day, and recently the importance of Hungary as a transit country has been increasing again: there are many things happening at both the Serbian and the Austrian borders and the situation is changing quickly. Even though most of the camps are full (and often overcrowded), there is very little information about the conditions there available. While there are record number of people crossing into Europe again via the Mediterranean, we would like to note that the Balkan route has practically not been closed. The number of people coming through the route is much less than in 2015, but there is a still a very severe situation. Serbia is the nodal point for people on the Balkan route, and as the border between Croatia and Serbia remains closed for people seeking protection, the only possibility they have is to enter Hungary. Because the number of people who are allowed to seek asylum in the official transit zone is very limited, many people continue crossing the border fence. Subsequently, people are either transported to open camps in Hungary, to asylum or immigration detention centres (depending on whether they apply for asylum or not). Those people who manage to apply for asylum in the transit zone either have an inadmissibility decision based on the fact that Serbia is a safe third country and are expelled from Hungary, or then they are considered vulnerable and transferred to open camps or detention centres in Hungary. We have testimonies for cases in which people have been beaten up, robbed and pushed back at Hungarian-Serbian border. Open camps in Hungary are severely overcrowded. In the camps and detention centres the conditions remain very bad. People report that they are overcrowded and that the access to legal support is extremely limited, if not non existent. In some cases, people we speak to are reporting that they are not told of access to lawyers even though there are lawyers present. Also the general and legal situation in Hungary worsens even more: a bill has been passed that tightens the material conditions of refugees extremely as outlined by Migszol earlier, the referendum about the acceptance of the EU quota system will take place in early autumn, the right-wing propaganda continues and disproportionate/illegal punishments and trials for refugees accused of starting a riot in Roszke in 2015 are still happening. There are ca. 290 people on a daily basis at the transit zones, while 491 people were registered to enter illegally into Hungary and were apprehended in Hungary between May 6th and 12th according to the border police.1,330 people arrived in Austria between May 6th and 12th according to UNHCR, and in the meanwhile Austria is planning an extremely tight asylum legislation that will most likely have severe effects on Hungary as well. The EU-Turkey deal is being questioned and a possible Plan B without Turkey seems to be planned. Bulgaria has signalled that it will start to return migrants to Turkey under a safe third country agreement from June 1, 2016. In the recent weeks the number of people coming from Greece/ Eidomeni through Macedonia has been increasing. Workers in Gevgelija are reporting regular push-backs by the Macedonian authorities. 11,000 people were pushed back since March 2015. 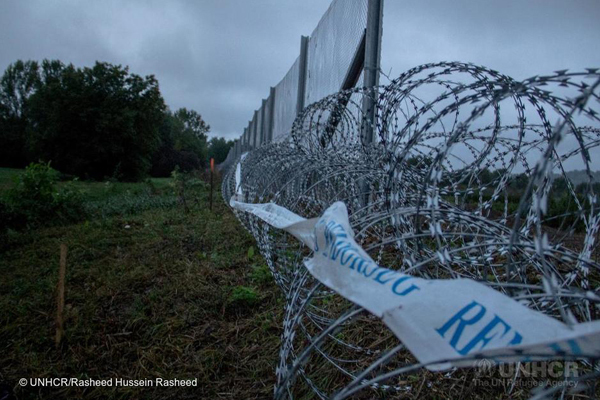 The ones who manage to cross seem to be heading to Hungary through Serbia. In Serbia, a new registration system was implemented in Presevo. It seems that the border police next to Miratovac is not sending people back to Macedonia anymore. For daily updates on the Balkan route, we advise you to read the reports of Are You Syrious, available here. According to UNHCR Serbia there is an “average of 290 asylum seekers on a daily basis, including many women and children, waiting to be admitted into the two “transit zones” at Kelebija and Horgos I border crossings. 126 accessed Hungarian asylum procedures while Hungarian authorities returned 22 single men (15 Afghans, five Iraqis and two Moroccans) to Serbia after spending 23 days in admission containers”. Hungary is planning to implement tougher regulations at the borders. The fence will be strengthened around the village of Asotthalom, famous for its refugee-hunting mayor. Migszol Szeged reports that fewer people are let through the transit zone into Hungary. This might lead to more and more people being stuck in Serbia in the coming weeks/months. Between May 6th and 12th 491 people entered illegally and were apprehended in Hungary (half less than the previous week). 290 people were reported to be waiting in Horgos and Kelebija. MSF is present. People are staying there for weeks but still there is no accommodation and no sanitary facilities. To get an idea of the conditions in the border, we recommend this four-minute video on HVG, in Hungarian but still totally worth watching it. The Szeged court continues to sentence for crossing the fence and gave many people an expulsion order for a year. Last week the Szeged office also received 36 asylum requests on top of the 50 they have already considered inadmissible, 9 rejections and 1 stopped. We have also heard testimonies of beatings and push-backs. A person who recently crossed the border from Serbia to Hungary, reported horrible practises of the Hungarian authorities. After this person and eleven others (among them a family with two young children) crossed the border from Serbia to Hungary, crawling through the fence, they walked through the swamps near the Tisza river (near Horgos), and they had to start running as the police approached them and they were still unsure about whether they could be pushed back to Serbia or not. According to the person we spoke to, the Hungarian police was right there and welcomed them with teargas and handcuffed all of them, including the women. Then, the police searched their pockets and bags, put everything they found on the ground and then ordered them to go into a police van. The people asked for their belongings, which were on the ground, which they couldn’t pick up because they were handcuffed. The police said “take it”, they said “we can’t”, police said “that’s your problem” and they had to go into the car. A lot of money, phones, papers, and whole bags and backpacks were left on the ground. They drove off without giving the things back to the people. Everyone except the families were brought to detention centre in Kiskunhalas. The person who reported to us told the police that he has a severe kidney disease and was the only single man brought to the open camp in Bicske from this group. He said that two minors were among those brought to detention centres. For more information on minors detained in Hungary, see the report by the Hungarian Helsinki Committee here. Several men reported to us that they have been brutally beaten up by Hungarian officials near the border. They were among those pushed back to Serbia from within the transit zone, after they spent 13 days inside. They were admitted to a hospital in Belgrade and released a few days later. On the Serbian side of the Serbian-Hungarian border: several groups have reported to have been completely robbed near the Hungarian border. Several bigger groups, exceeding 55 people have reported to have been beaten up, robbed and stripped naked, and then being forced to return to Belgrade. The coordination among support groups and NGO’s between the Serbian and Hungarian side of the border, especially near the transit zones, is poor. This has been leading to inadequate medical treatment for people at the border, because medical staff has not been communicating with each other. This points to a more general problematic of lack of cooperation and communication between people working across borders. The parliament approved law changes that will tighten the material conditions of asylum seekers in Hungary even more (see Migszol article on the draft here), although the reduction of space in detention by half, which was proposed in the draft, was removed from the final text. The final text is not available yet. From 1st June 2016, all integration support for recognized refugees will be abolished, and all refugees will have their case re-examined every three years. The Ministry of Interior has also announced new measures on enforcing stricter border control in Hungary that says that those people who cross to Hungary would immediately be taken and kept in transit zones. We have not more information on this yet, and we wait to see whether these new measures will be taken up in case Austria starts push-backs to Hungary. Lastly, and very seriously, ECRE bulletin reports that Hungary has attempted to start Dublin deportations to Greece again. The parliament voted concerning the referendum against the quota resettlement system of refugees proposed by the EU. Only five MPs voted no to the referendum, with the majority of the opposition parties simply abstaining. The referendum will take place between mid-August and October and public opinion is being asked on whether the consent of the Hungarian parliament is needed for any mandatory settlement of non-Hungarian citizens in Hungary or not. Hungarians who live outside of Hungary will be allowed to vote about the quota system. The government has announced and begun a new propaganda campaign on their Facebook page (“Brussels needs to be stopped”). Independent PM Szelenyi Zsuzsanna asked MoI Sándor Pinter whether the migration strategy that the government created in 2013 is still valid and used, and the answer was that because of the recent changes it needs to be updated. During the last weeks there has been a lot of discussion about the newly opened camp in Körmend. Near the Austrian border. Refugees have been accused of harassing young girls, but it turned out that the news were fake. Janos Lazar, the high-ranking Fidesz politician who also commented on the fake news, admitted he lied about the Kormend situation and the Democratic Coalition will file a complaint against him for creating fear by spreading fake information.On 17th May, the Hungarian secret service expert Földi László said on the state TV that the “refugee wave is a terrorist attack by itself”. There is a trial going on in Szeged against four Romanians and one Hungarians who tried to smuggle people last summer, and the Hungarian Helsinki Committee has revealed how an Afghan man was fined 50 000 HUF (160 EUR) in Kormend for not using the zebras when crossing the road. A man who robbed ten Afghans last year was sentenced to 10 years, and the trial against the disabled refugees for allegedly starting a riot in Roszke in Autumn 2015 is still ongoing. In the Szeged court the case of a minor Pakistani, who was first ruled to be an adult and got a 2-year ban to Schengen in September, is taken up again as his lawyer managed to prove he was a minor. The boy is nowhere to be found, but supposedly he is in Hungary somewhere. A group of minors, who were wrongly registered as 18-year-olds by the authorities, reported to us that they travelled from Bicske to Budapest two weeks ago, where they were apprehended by the police at Keleti train station. Without any questioning about what they were doing, they were immediately brought to Kiskunhalas detention. They did not have tickets to Vienna on them, and they had their official police cards and camp entrance cards from Bicske. They said that they had no evidence on them that would prove that they would try to leave the country. At the same time, Migszol members in Budapest have in the recent weeks many times encountered groups of minor asylum seekers apprehended by the police in the city. In case they were staying at the camp for minors in Fot, the police bring them back to Fot. Please see the Migszol map of open camps and detention centres in Hungary here. The map is accurate, but we are in the process of updating the descriptions of the camps – we ask for your patience, as we want to make sure you will have the most up-to-date information as possible. Vamosszabadi, an open camp on the Slovakian border, is severely overcrowded, with ca. 430 people all the time. Kisalfold, the local newspaper in the Gyor area, reports that people are sleeping even in the dining hall. Most people stay only for a few days, and earlier Migszol wrote about the 26-year-old who was shot by the Slovak customs authorities near the border. The smuggler, in whose car the Syrian woman was shot, was a Hungarian, driving a Hungarian Mazda. Three of the four cars were Hungarian, including a taxi. As Kisalfold reports, the local government and the mayor of Vamosszabadi are campaigning for closing the camp and waiting for an appointment with the Ministry of Interior regarding the possible closure of the camp. The reporter questions the statistics that Janos Lazar has quoted about migration. It is unclear when and where the new legislation that stops cash allowances comes from. According to people living inside the Vamosszabadi camp, there are papers posted on a wall in Vamosszabadi that explain that Hungary cannot pay weekly allowance money to people seeking asylum anymore starting from April 1, because Hungary is a poor country. While, at the same time, some people in Bicske still receive their pocket money. Repeatedly several people detained in Kiskunhalas that we are in contact with reported to us that they have very limited if no access to lawyers in the detention centre. They explained to us that they are not able to get information from the social workers inside on where and how one can meet a lawyer from the Hungarian Helsinki Committee. According to them, social workers don’t speak English and often ignore them and the immigration office doesn’t provide informatio either. Additionally people also report that the times when they can meet with doctors are limited and they do not get the treatment they need. One example is the case of one person, who has severe tooth ache and is only “treated” by getting pain killers once in a few days. Detainees also reported to us that a person in Kiskunhalas attempted to commit suicide through hanging himself in his room by tearing apart the blanket and connecting the parts into a rope. The man was brought to a local hospital. Many people are reported to be depressed inside the detention centre, saying that it is hard to distract oneself from thinking always the same things as there is absolutely nothing to do there. There was a small riot in the Bekescsaba detention centre: five Iranians broke a window with a chair and made noise, and then they threw the chair at the guards. Widely reported in the media, they were presented basically as criminals, saying that the guards “were not harmed”; the asylum seekers are now charged with breaking the order, now that apparently there is “peace in the town of Bekescsaba” as they did not manage to escape the detention centre.